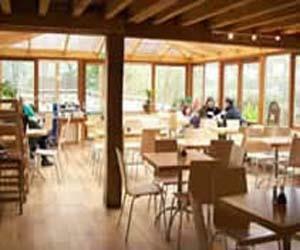 The Green Oak Cafe at GreenWood Forest Park CafeOur Green Oak Cafe is the ideal place for a family lunch. Choose from the extensive menu of jacket potatoes, burgers, hotdogs, chips, salads, a range of light lunches and other refreshments. Much of our menu has been carefully sourced to give you a tasty selection of Red Tractor, Fairtrade and Marine Stewardship Council Approved meals. Watch out for the Chef's Specials. Serving Fairtrade freshly ground coffee, tea and hot chocolate and a range of herbal teas. Our Green Oak Cafe is the ideal place for a family lunch. Choose from the extensive menu of jacket potatoes, burgers, hotdogs, chips, salads, a range of light lunches and other refreshments. For SatNav: use LL55 3AD and follow brown tourist signs marked 'GreenWood Forest Park'. GreenWood is situated off the B4366 Bethel to Bangor road between Caernarfon and Bangor. Follow brown tourist information signs.